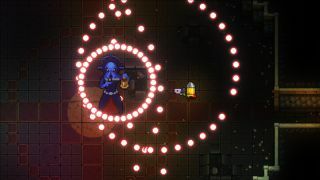 The bullet hell dungeon crawler gets a best-ever discount. Forget dungeon crawling, get into some dungeon run-and-gun in Enter the Gungeon, currently available for $5 (66% off) at Chrono.GG for a limited time. You fight through levels that mix hand-crafted and procedurally generated layouts, mowing down the denizens of the heavily armed Cult of the Gundead. As you loot the dungeon you find increasingly ridiculous weapons that fire rockets, lasers, cannonballs, fish, rainbows, and bees, obviously. As noted in our Enter the Gungeon review the loot distribution can be stingy, but the guns themselves are splendid and one of the main characters has a dog. We have word that Chrono.GG will be putting Superhot on sale at a big discount at some point today as part of a rolling series of sales. We'll flag that up when it happens, meanwhile enjoy this entertaining display of lasers.